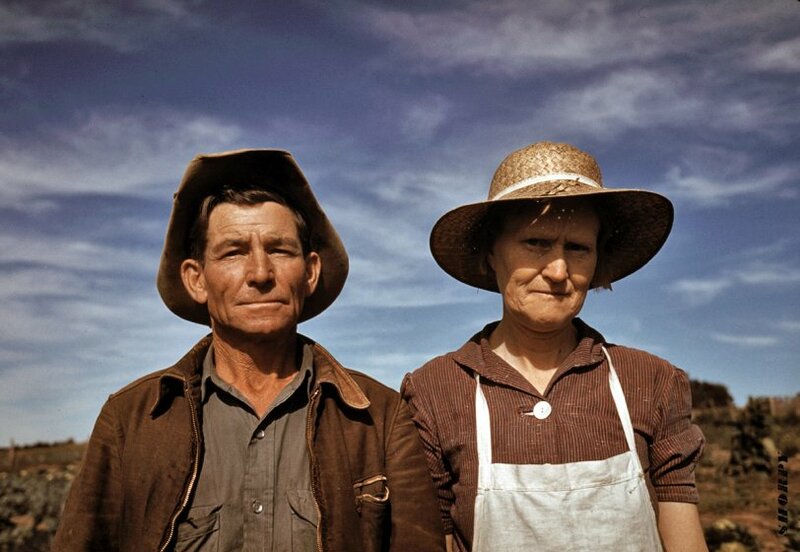 Homesteaders Jim Norris and wife, Pie Town, New Mexico. October 1940. View full size. This is one of hundreds of pictures taken in Pie Town by Farm Security Administration photographer Russell Lee in 1940. Submitted by Anonymous Tipster on Sun, 04/22/2007 - 9:24pm. that the women always look so much older than the men in these shots? Submitted by Anonymous Tipster on Tue, 04/03/2007 - 5:24pm. I don't know if the photographer posed his subjects after the famous painting, but I think this one truly conveys the soul of America's people. Life in Pie Town New Mexico in the 1930-1940 period was still very harsh and the people were highly self sufficient. My Grandfather was a cowboy missionary to the people of much of New Mexico, Arizona, and Colorado from 1922 to 1955. First on horseback and later by model T and other autos, he provided non-denominational services to the people of far-flung communities, farms and ranches, including Pie Town. He would usually work as a hand on a ranch or homestead for a few days until the word would get around that he was in the area. Then conduct services, weddings, baptisms and even a funeral months after the pioneer had passed. He claimed he never met an atheist! Submitted by Dave on Sun, 03/25/2007 - 11:10pm. I thought the same thing. We can thank the good people at Eastman Kodak for inventing Kodachrome film in time for Russell Lee to take these pictures. Submitted by Anonymous Tipster on Sun, 03/25/2007 - 10:33pm. This Pie Town series is just incredible. Every shot looks like it was taken yesterday.